This easy to make, healthy family meal was sent to us by Stephanie from Neenah, Wisconsin. Her Slow Cooker Vegan Chili Recipe features meatless crumbles of a plant based and protein rich meat substitute. 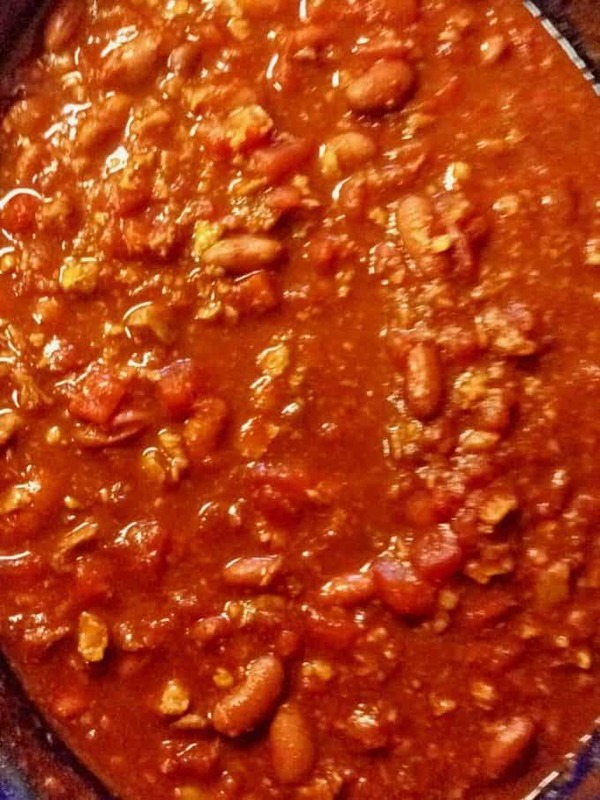 Stephanie opted to use a Morning Star product but tells us that Beyond Beef is another brand of meatless crumbles that she recommends for this Slow Cooker Vegan Chili Recipe. Stephanie tells us she improvises when creating this Slow Cooker Vegan Chili Recipe, using whatever she may have on hand that keeps it vegan, healthy and most of all delicious. We love this Reader’s Circle Recipe for it’s simplicity, convenience and broad appeal to the whole family. Besides tasting great, this Slow Cooker Vegan Chili Recipe is perfect for busy parents who are on the go. Thank you, Stephanie, for sharing this great recipe with the Platter Talk’s Reader’s Circle. 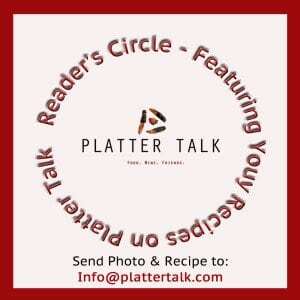 Share your recipes with Platter Talk! Send us a pic (doesn’t have to be fancy – a phone picture works just fine!) along with the recipe and we will share it with our readers. Email to [email protected]dotcom and include a photo. Any photo will do, even a phone pic! Place all ingredients in a slow cooker on low for 6-8 hours. This looks amazing! Trying this for dinner tonight! Thank you!! This chili looks fantastic! I just sent this to my vegan cousin hoping she will make it and invite me over LOL! I like how you think, Beeta; I think I may want to stop by as well! Thanks so much for dropping by and leaving a comment! Who needs the meat in this fabulous looking chili. Yum! Thank so much, Nancy. And agreed! I have never tried a vegan chili but I bet I could make this and my husband not even know the difference. Thanks. I haven’t cooked with morning star crumbles in a while, but they are quite good. Excellent option in a recipe like this comforting bowl of chili! This looks so delicious and perfect for chilly weather. Too funny! We are thinking alike here… I am attending a vegan pot luck this weekend and just picked up everything I need to make a began friendly chili! This one sounds great Dan!!! 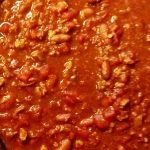 We love a good chili and one that we can put into a slow cooker and walk away from it- is even better! Thanks for an easy recipe! Why spend a small fortune on morningstar products or others like it when you can just use generic TVP? Dry TVP doubles in volume and looks, tastes just like hamburger. I make tacos with it all the time and no one knows the difference. I use NOW brand 12 oz TVP, which makes almost 4 pounds of product. $3. Can you get 4 pounds of beef for $3? Morningstar is even more than beef. Great comments, Ben. And a good reminder that cooking like everything else, often boils down to personal preferences and more times than not, budget Thanks so much for stopping Platter Talk.